As Cri-kee finishes sketching the outside of the ride, he holds on tight as Diablo swoops into the lobby. Diablo lands on top of what looks like miniature statue placed near a portrait of a man. Cri-kee hops off of Diablo and sits atop the statue. He starts to sketch out the layout of the room. He then notices what looks like a broken and crushed machine. He looks closer to find that there are locks of red hair underneath the crushed contraption. He then notices that underneath are the bodies of the three little boys with red hair. Cri-kee jots in his notes and decides to avert his gaze from the scene. Cri-kee looks up at Diablo and gives him a sympathetic look. Cri-kee looks around the room to see if there are any clues. He sees Si & Am looking like they were behaving. He sees Vanellope's face turning red and a few pieces of candy from her hair melting. He then accidentally makes eye contact with King Candy and quickly averts his gaze. He then sees Alice with a horrified look as she looks at the scene. Cri-kee stares at Alice. Suddenly, Cri-kee's stomach starts to grumble. He remembers Alice having food in one of her pockets. Cri-kee looks at Diablo and motions him to fly Cri-kee over to where Alice was. Cri-kee climbed on Diablo, Diablo spread his wings, and they start to fly. Diablo circled above Alice, and Cri-kee starts to aim towards Alice's pocket. He dives off of Diablo, and he makes it into her pocket. Cri-kee shuffles inside to see some crumbs that were decent sized for a cricket to eat, and he sees a note that says "Eat Me." His stomach starts to grumble, and Cri-kee starts to nibble at the crumbs. Cri-kee starts to feel weird, but continues eating. As he finishes, he peeks out from her pocket and listens to what Scar has to say about the scene of the crime. "Listen everyone this is getting out of hand. I was just about to send these three back home as they were not helping this investigation with their playing, but I guess the killer got them first. Maybe I should have hired this killer to kill Simba as a cub instead of depending on those stupid hyenas. Anyway...it seems as if I have found a clue....a BLACK HAIR. I am taking it personally next door to DFI lab as I am upset I have not heard more from them. I want all of you to ride this attraction and keep your eyes out for anything unusual as you do. It may take several rides as their are several elevators. I suggest maybe splitting into two groups. Don't worry about being disturbed by guests. I will close it down to the public and give you plenty of time." OOC* As the pin event approaches I know more and more of you will be busy....therefore there will NOT be another post count or post count death until after the event. False accusations will still be the same and the game will go on, but the pace will slow down a bit, although I'm sure our killer will not. King Candy noticed Cri-kee had now entered the lobby with the raven; the cricket seemed to be avoiding looking at him. This wasn't good; he'd have to find a way to get Cri-kee to like him again. The cricket then hopped across the floor and went in Alice's pocket for some reason, King Candy frowned... what was he up to? Oh no! What if because he had shouted at Cri-kee; the cricket now had made friends with her!? His thoughts were interrupted when Scar told them to ride the ride a number of times. "Isn't the elevator they were crushed by a regular elevator? You know, aha, elevators are quite safe! They have many cables... I would like to look at the mechanism! I wonder if the murderer somehow cut all of them... or... weakened them somehow? Yes," King Candy declared as he wrote down the latest development in the case. "Of course... when you deem it fit, Scar..." He added with a smile. "I'm more than happy to ride the ride!" Cri-kee jots down the evidence of the black hair. He learns that it was an elevator that crushed the boys and that it is held by numerous ropes made out of wires. Things were getting interesting. He thought of suspects would can fit this description. Cri-kee imagines a battle between Shan Yu and the killer, and he ponders who would win. As Cri-kee finishes taking the notes, he wonders how he would even ride on this ride. If the ride goes up and down fast, he would have to hold on to someone. He thinks about asking King Candy for a ride on his helmet, but Cri-kee thinks that King Candy would still be angry at him. Cri-kee's stomach starts to grumble. Suddenly, he legs start to grow, ripping holes from Alice's pocket. His antennas start to extend. Finally his body starts to grow and grow, which causes Alice's pocket and parts of her dress to rip. Cri-kee closes his eyes and continues to grow, making Alice lose her balance and fall on the floor. The growing eventually ceases. Cri-kee opens his eyes, and he sees all the detectives staring at him with looks of shock. Cri-kee looks down to see he is on top of Alice. Alice looks into Cri-kee's eyes and lets out a scream. She pushes Cri-kee off of her and starts to pant. Cri-kee sees a reflection of himself, and his eyes widen. He has grown to be as tall as Alice. He sees Si & Am, their mouths wide open in shock. I guess I won't have to worry about height requirements anymore. He looks at Diablo and winks at him. He then looks at King Candy and notices that he was taller than him. Cri-kee thinks to himself, and he lowers his head and motions King Candy to ride on Cri-kee. Alice made her way to the front to see what everyone was gasping about. It turns out the three young men had been killed. It occurred to Alice that although they didn’t really talk to one another, they reminded her of Tweedle Dee and Tweedle Dum. As she looked horror, she only strengthened her resolve. She had to find the murderer before he struck again. She decides to ride with Vanellope, as she rather liked the young racer and decides to send a text to Belle but before she could do so, something grew out of her pocket. Alice fell to the floor along with pieces and crumbs of her growing cake. The monster grew and grew, taller than Alice, and she screamed and ran before she realized it was just the cricket. Knowing that her growing cake not only made you grow in size but also multiplied your strength, she knew not to say anything that would make him angry. She would have to wait it out until the effects wore off or somehow give him some of the shrinking cake. When he returned to his normal size, Alice was going to lecture him about the use of Wonderland magic and its effects. They were not toys after all. It took a mature lady, like herself, to wield such magic. OOC: LOL at the growing Cri-kee and yes you're doing an excellent job portraying King Candy! King Candy's attention was again brought towards Cri-kee when he heard Alice scream; he blinked a couple times at seeing the now rather large cricket. Guessing Cri-kee must of taken some of that growing and shrinking food Alice had, he got slightly nervous. Perhaps Cri-kee was going to attack him? He was now taller than the King after all! "Aha! Wait... wait a moment!" King Candy started, but then noticed Cri-kee motioning for him to hop on. He grinned; the cricket obviously was not angry at him! The diminutive man jumped on top of Cri-kee with ease. "I'm sorry for the misunderstanding, aha! I only found your note afterwards," He said and patted Cri-kee's head. "You know, you're now a pretty big bug! Ehehe. Though..." He whispered to Cri-kee. "I'm quite a bit taller in Cy-Bug form myself," King Candy giggled; happy he and the cricket were friends again. "Now! To the ride! Cri-kee away!" Vanellope agrees when she hears Scar say that this is getting out of hand. Too many of them have died, and it worried her to think who might be next. She gets out her notepad after Scar finds the black hair and writes down the new clue. When Scar tells them to ride the ride and look for new clues, Vanellope is a little apprehensive at first. After seeing the three boys crushed, she isn't exactly thrilled to get on one of the elevators. But, she doesn't want to face Scar's wrath either, even though she's pretty sure she could get away from him pretty easily. As Vanellope heads to one of the elevators, she is glad to see that Alice decided to join her. Being in groups might be the only thing that's kept them alive for this long. When Vanellope hears Alice scream, she quickly turns around, only to see a giant Cri-kee! Startled, Vanellope backs away from the group. She knows that Cri-kee wouldn't hurt any of them, but seeing him briefly reminds her of the cy-bugs. After the initial shock though, she calms down and starts to laugh a little. "I hope I don't die." "I must ride again to be sure." Cri-kee is excited that he was as big as his friend Khan. Cri-kee then motions to Diablo to perch on top of Cri-kee. He starts to hop about and feels King Candy grasping on his antennas and hears him laughing from above. So this is what the big ones feel like! Amazing! Cri-kee hops toward the entrance to the elevator ride. King Candy and Diablo both get off of Cri-kee. They enter the elevator ride and take their seats. Cri-kee fit comfortably into the seat, and he straps himself with the seat belt. A huge grin appears on his face, awaiting the ride. "Be careful my love. I believe the one elevator falling is a fluke but you never know. I will be back shortly and hopefully with some info that will help us solve this case." "These fools think this is a game. I bet Pumba would love to have that bug for lunch." King Candy jumped off Cri-kee once they were in the elevator ride; he took the seat next to the cricket... it seems that raven was also a friend of the cricket now... how odd! A bug and a bird... friends? He smirked as he strapped himself into the ride. "Ahaha! The first ride actually get to go on here! I'm sure this will be quite fun!" King Candy grinned, rather excited... even though he was an older fellow he didn't mind scary rides at all... after all he was a race car driver... and a crazy one at that! He was quite glad though that his crown was programmed to always return to his head, as he guessed it would fly off during this ride. "Though we mustn't forget to keep a look out for cluuuuues!" Diablo can't stop laughing when the growing Cri-Kee suddenly bursts out of Alice's pocket! He nearly tumbles off his perch on the statue. Accepting the invitation, Diablo flutters over to hitch a rie on Cri-Kee's head. So kind of him to return the favor! And it looks like that candy king isn't feeling all yelly anymore. That's good. In the ride, the straps are too small for Diablo, so he contents himself with gripping the seatbelt tightly and balancing himself with his wings. He wonders if they'll find any clues on the ride... Scar has already told them about the black hair he found. After the ride is over, Diablo motions to Cri-Kee's scroll with an inquisitive caw. Maybe they should go over all the clues so far? *OOC: This is hilarious, I love it! Si and Am watch the small cat toy grow into a large cat toy, too large really. They decide to keep their distance until he returns to normal. They slowly walk to the ride loading area looking for clues. Not finding anything the go into the ride car. As it had been a while, they select a seat, curl up, and take a nap. *As Scar gives her a kiss goodbye, Ursula takes a look at the current crime scene before taking a picture of the gruesome pile of dead children. Placing the photo in her folder of crimes and evidence, she pondered either sending it to Merida or posting it on her villains blog once this was over with. Following the others to the service elevator, the sea witch took into account the mass collections of "junk" he seemed to have acquired from his travels. "I wonder if he is any way related to a certain mermaid I know, Ugh. Gods forbid I'm related to this fop..."
"Move over Girls, Curvy Women need their space..."
*Outside, Belle found herself intertwined in bowing hello to almost every guest she met..."
King Candy sat waiting for everyone else to get on the ride; it was while he was sitting here that he realized he had left his cane in his car... he'd have to retrieve it after the ride he thought to himself. "Cri-kee or Birdy; remind me to retrieve my cane after the ride, aha!" He stated while making sure his waistcoat was in order... oh and his... hair (not that there was much of it), even though it was bound to get messed up during the ride. King Candy was back in a good mood; but he hadn't forgot who he considered enemies out of their group either... it was officially up to five of them now. "Oh! And Cri-kee," He again spoke to the cricket. "I am still going to make you a member of my royal court! Aha! You'll get a title! And you can meet Sour Bill! My adviser... yes. He wouldn't like this ride... no." King Candy was wondering where the some of the others were right now though. Cri-kee moves around, finding a comfortable position. He was able to fit on about two and a half of the seats. King Candy discusses with him about being a part of his court, and Cri-kee smiles thinking about being a part of King Candy's royal court. He was not sure about meeting Sour Bill. His name sounded a little weird to him and a little bit unpleasant. Cri-kee waits in anticipation until the ride starts. OOC: I had to post just to say that Ursula's post was hilarious!!! OMGosh! I can't stop laughing on your post about Belle! Ahahahah!!! Heinz gets on the same elevator again by himself. It goes up and stops at a floor with just a mirror and suddenly he is looking at green eyes. He is startled, but quickly realizes it's just part of the attraction. The elevator then goes all the way to the top and looking out over the park, Heinz confirms what he thought he had seen earlier. He decides he must tell the others. After the drop he gets off the elevator as quickly as possible. He runs around looking for someone to tell, but he sees no one. Near the gift shop he sees a place with video monitors and pictures of riders expressions during the drop. First he sees one of himself and the next one is of the group. This means they should be exitting soon...he waits and sure enough here they come. "I think Mermaid Lagoon may be on fire.....atleast I saw smoke from that direction." No one pays any attention to him. This makes him angry....he storms out of Tower of Terror to go investigate for himself. On the way out he sees a small cookie on the floor that says EAT ME. Not thinkinyg he picks it up and eats it in one bit. As he exits the attraction he feels kind of funny. Suddenly he finds himself growing to giant size and looking far below at the crowd of guests. He hears someone shout something about Godzillas return. After Vanellope calmed down a little after the giant Cri-kee episode, she noticed that the others had already boarded the elevator. She decides to sit next to Alice, who luckily is sitting far away from King Candy. She's a little small for the ride, so she makes sure to really buckle herself in and hang on tight. Soon, the ride starts, and Vanellope almost forgets to look for clues while riding. She's pretty sure she didn't see anything though. She does wonder if anyone else saw anything though. As they exit the ride, Vanellope thinks she hears someone yelling at them, but, not wanting to get separated from the group, she keeps walking. After the ride King Candy was more interested in the photo that had been taken during it; in fact he had been extremely giggly throughout the ride... finding it to be very fun indeed! He also found the picture to be hilarious! Especially the looks on some of their faces, so he bought a copy of the photo... not that there were any CMs manning the counter at the time... but he made sure to leave a pile of candy on top of the cash register anyway. He thought he heard Doof-whatever yelling a moment ago, but had paid no attention as that guy was CRAZY. Soon afterwards though there seemed to be a bit of a commotion from outside the ride. "Hmmm... do you hear that...?" He mumbled to no one in particular and exited the ride. King Candy jumped eight feet into the air in surprise at the scene before him. "AHHHH! 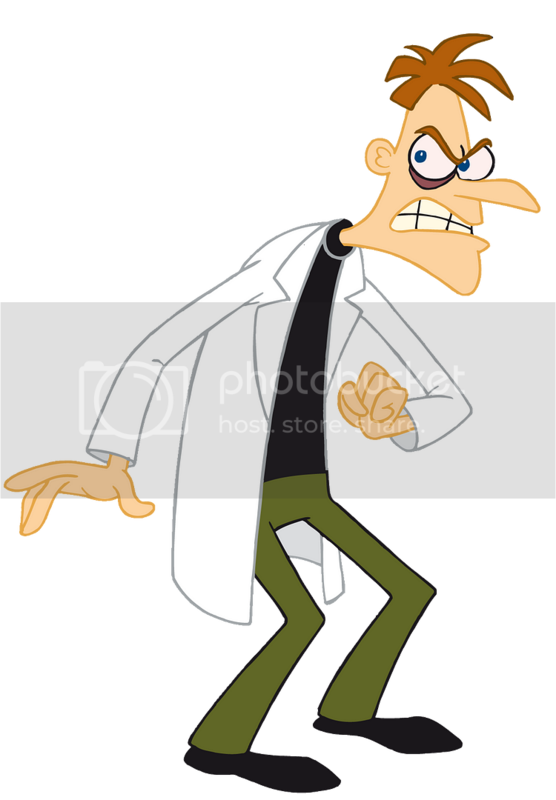 Giant Doof-whatever!" He yelled in fright; but as he did noticed Belle was in the vicinity right now... where had she been!? "You! Yes, you! Aha! Watch out for that scientist on the rampage!" "You two over here now!!" Scar: "I want answers and I want them now! Tell me what you know from what has been turned in." DR BUNSEN: "Well not much Scar, but here are a few things...the fur is brownish and belongs to a species known as Shika here in Japan. The blood spots came from the tiger, but also another source....here is the funny thing the DNA from the blonde hair and the DNA from the blood do not match. Finally we are getting a little closer to identifying our second victim. Using an iron reduction test we were able to find a small tattoo of the initials RW....Now Scar I know you are anxious, but this is still day one of your official investigation." Chief Yamadera...talking to Scar." Scar get your team to Mermaid Lagoon on the double....there is a fire and even though it is under control, I want to know how it started. Plus get that giant scientist under control. I have enough chaos without that. I mean I have murders, fires, complaints about closed attractions and now to top it off the bakery is not able to cook cakes....something about missing ingredients.......No No don't worry about such a minor thing....I'm not even sure it's connected...just tell me how that fire started."